I was just commenting to my husband that some flowers seemed slow this year. He said an old gardener had commented that Camellias were “wise” : they didn’t bloom all at the same time. 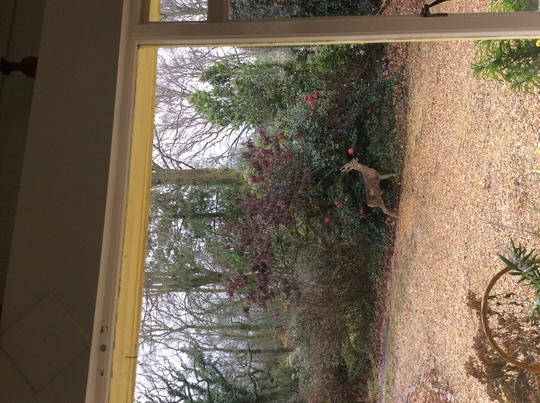 Five minutes later we saw this visitor to our garden. Have a feeling he knows his way around it. Oh how exciting - makes our mice look a tad boring. Obviously knows a tasty flower! Very pretty photos. I am happy it is in your garden and not ours.......they can cause so much damage, so as much as I admire your capture, that is as far as it goes! wonderful photo, such a lovely majestic specimen. Wow, that's impressive - did you know there were some in the area? What kind is it? The common kind I would imagine, Stera. Must find out. 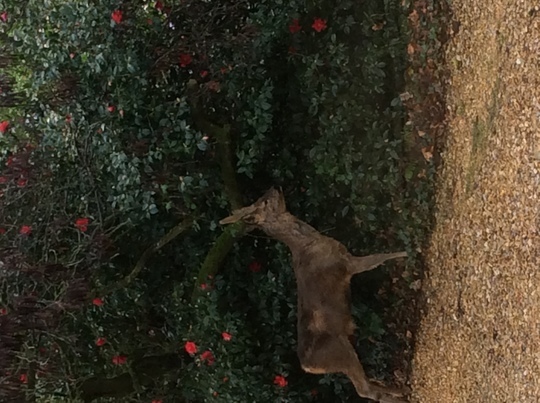 Yeah..looks like Roe Deer. Beautiful!